Seán McCárthaigh talks to Manic Street Preachers as they touch down for their Irish live dates. Two years on from the unexpected hit that was Everything Must Go, a new week finds Wales' finest musical export since Tom Jones on another round or media interviews. There is a freshness to the voice of Nicky Wire, the Manics' gangly bass player. The mystery surrounding the band's missing member, Richey James no longer dominates conversation and Wire and guitarist James Dean Bradfield and drummer Sean Moore are now looking forward a new album and tour. Anticipation is high about the Manics' follow-up to Everything Must Go - the record that caused them to shake off their cult status and become regular chart-breakers. Even though such entry into the industry's mainstream was unplanned, the Manics have remained one of the most innovative and individualistic groups of the 90s by staying true to the musical forces that have shaped their career since they formed in 1988. "We never made records for other people but I can't deny that having Everything Must Go become a big success was a great moment," admits Wire. For their many Irish fans, this month's concerts will act as the introduction to material off the band's new album, This Is My Truth Tell Me Yours which is due for release on September 14. DJs will certainly have to practise their breathing exercises before introducing the Manics' latest offering as it will be preceded by the single If You Tolerate This, The Children Will Be Next. It's a warning inspired by the Spanish Civil War and the way a lot of people - especially from where I live in Wales - went and fought for the International Brigade against fascism," explains Wire. "I think it's fair to say people probably wouldn't do it today. It's also quite a critical song of myself." Wire and co have survived the occasional controversy by always having their hearts in the right place. South Yorkshire Mass Murderer off the new album is likely to provoke more outrage, dealing as it does with the thorny subject of the Hillsborough disaster. "It's just a song about asking for an apology. We only want the authorities to hold their hand up and for once say sorry," says Wire. As sole lyricist with the group, Wire also accepts they may face some flak over another new number, Born A Girl, which Was inspired by his own love for wearing make-up and dresses. Already, one female fan has remonstrated with the bass player over his contention that it might easier to be a woman. One doesn't need to be a detective to identify the source of the band's more sombre mood. The disappearance of the group's frontman Richey James in February 1995 after a period when he was receiving treatment for depression has dominated most stories about the Manics until recently. Although his whereabouts remain unknown, James' car was found close to the Severn Bridge - a notorious suicide spot that spans the Welsh-English border. The tragic episode has unquestionably robbed the Manics of their previous zest for notoriety and a penchant for the headline-grabbing comment. In the early years, Wire concedes they to loved to slag off other bands even though some of their most die-hard supporters found indefensible a remark they made about wishing AIDS on REM's Michael stipe. 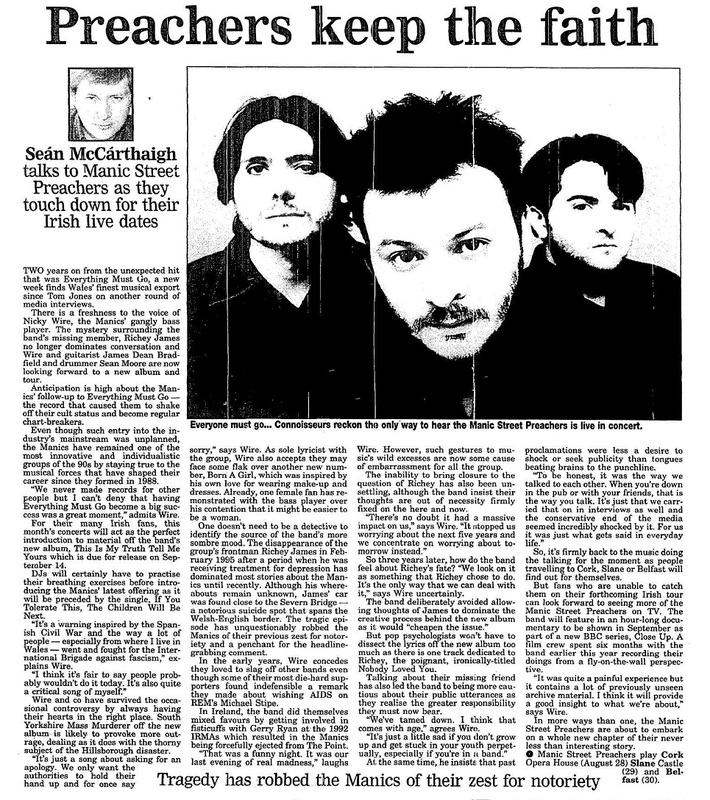 In Ireland, the band did themselves mixed favours by getting involved in fisticuffs with Gerry Ryan at the 1992 IRMAs which resulted in the Manics being forcefully ejected from The Point. "That was a funny night. It was our last evening of real madness," laughs Wire. However, such gestures to music's wild excesses are now some cause of embarrassment for all the group. The inability to bring closure to the question of Richey has also been unsettling, although the band insist their thoughts are out of necessity firmly fixed on the here and now. "There's no doubt it had a massive impact on us," Says Wire, "It stopped us worrying about the next five years and we concentrate on worrying about tomorrow instead." So three years later, how do the band feel about Richey's fate? "We look on it as something that Richey chose to do. It's the only way that we can deal with it," says Wire uncertainly. The band deliberately avoided allowing thoughts of James to dominate the creative process behind the new album as it would "cheapen the issue." But pop psychologists won't have to dissect the lyrics off the new album too much as there is one track dedicated to Richey, the poignant, ironically-titled Nobody Loved You. Talking about their missing friend has also led the band to being more cautious about their public utterances as they realise the greater responsibility they must now bear. "We've tamed down. I think that comes With age," agrees Wire. "It's just a little sad if you don't grow up and get stuck in your youth perpetually, especially if you're in a band." At, the same time, he insists that past proclamations were less a desire to shock or seek publicity than tongues beating brains to the punchline. "To be honest, it was the way we talked to each other. When you're down in the pub or with your friends, that is the way you talk. It's just that we carried that on in interviews as well and the conservative end of the media seemed incredibly shocked by it. For us it was just what gets said in everyday life." So, it's firmly back to the music doing the talking for moment as people travelling to Cork, Slane Or Belfast will find out for themselves. But fans who are unable to catch them on their forthcoming Irish tour can look forward to seeing more of the Manic Street preachers on TV. The band will feature in an hour-long documentary to be shown in September as part of new BBC series, Close Up. A film crew spent six months with the band earlier this year recording their doings from a fly-on-the-wall perspective. "It was quite a painful experience but it contains a lot of previously unseen archive material. I think it will provide a good insight to what we're about," says Wire. In more ways than one, the Manic Street preachers are about to embark on a whole new chapter of their never less than interesting story. This page was last modified on 22 May 2018, at 06:53.